The North American Free Trade Agreement (NAFTA) is a trilateral trade agreement between the United States, Canada, and Mexico that was signed on January 1, 1994. On September 30, 2018, it was announced that NAFTA had been renegotiated and was set to be replaced by the United States – Mexico – Canada Agreement (USMCA). Provisions are expected to be implemented starting in 2020 if Congress, including the newly Democrat controlled House of Representatives, ratifies the agreement. As it is currently written, this new trade agreement includes several rules that will directly affect the automotive industry. Beginning in 2020, content, labor, and purchasing rules for duty-free crossings will become stricter under Appendix 1 to Annex 4-B “Provisions Related to the Product-Specific Rules of Origin for Automotive Goods.” These increases will phase in over several years to allow manufacturers to evaluate their supply chains and adapt sourcing strategies. There are several new requirements unique to USMCA as well. Beginning in 2020, 30 percent of work completed on vehicles must be performed by workers earning at least $16 per hour. This percentage will increase to 40 percent in 2023. Refer to scheduled increases in the chart below. Also beginning in 2020, 70 percent of steel and aluminum purchases must be made in a USMCA country. In May 2018, President Donald Trump directed the U.S. Department of Commerce under Section 232 of the Trade Expansion Act of 1962, to review whether imported vehicles posed a threat to national security. Related to this, President Trump proposed imposing 25 percent tariffs on imported automobiles and automotive parts. This is a particularly important development, given how integrated the vehicle manufacturing process is amongst USMCA countries, and how significantly such tariffs would impact cost and ultimately retail price to the consumer. The National Automotive Dealers Association (NADA), estimated such tariffs would increase the average vehicle retail price by $4,000. Such dramatic price increases would undoubtedly negatively affect new vehicle unit sales. USMCA quotas will insulate manufacturers in Canada and Mexico from the effects of Section 232 tariffs for both automobiles and automotive parts. However, tariffs of 25 and 10 percent respectively, will remain in place on steel and aluminum imported from Canada and Mexico. NAFTA provisions will remain in place through the end of 2019, allowing manufacturers to strategically position themselves to comply with USMCA, or move operations out of USMCA countries. The impact will vary by make as each manufacturer will have to evaluate their supply chains, specifically related to plant locations, assembly sites, and country of origin for core parts. The National Highway Traffic Safety Administration (NHTSA) annually reports this information by model to provide consumers with information under Part 583 of the American Automobile Labeling Act (AALA). The 2018 report can be accessed here. This may provide some insight into which way manufacturers will shift production based on current data. 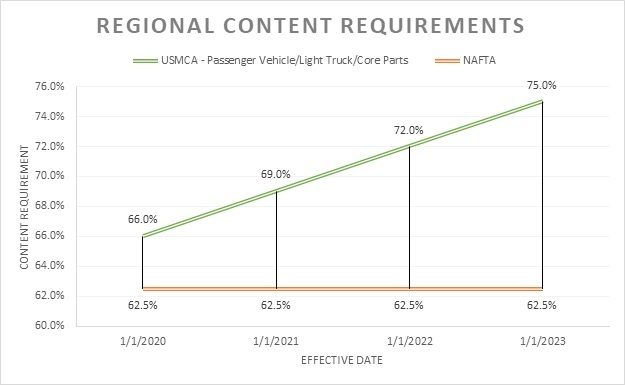 Higher Costs Under USMCAOnce USMCA is implemented in 2020, manufacturers may incur additional cost and time to meet content, labor, and purchasing reporting requirements. The labor value requirement will likely lead manufacturers with deeper roots in USMCA countries to shift production jobs from Mexico to the United States and Canada to meet wage requirements. 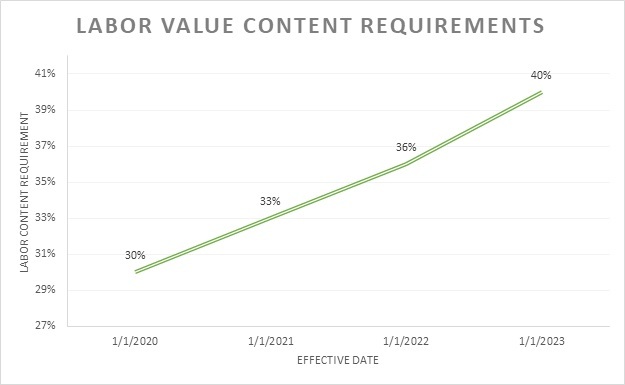 It is also likely that higher content percentage requirements will raise material costs to manufacturers. Higher material and labor costs will ultimately increase retail prices. As interest rates are already on the rise, higher prices may influence consumers in the market for replacement vehicles to consider used vehicles that are less expensive. Financing more expensive vehicles may also become more difficult for less creditworthy consumers. One potential win for manufacturers complying with USMCA is the quotas exempt from Trump administration tariffs under the Section 232 side letters. The need to address such issues in side letters indicates an even greater probability that such tariffs will be implemented in the near future. If this happens, manufacturers operating under USMCA may experience a competitive advantage, assuming costs of compliance are lower than the potential 25 percent tariffs. If Section 232 tariffs increase prices as much as estimated by NADA, this may lead to a large drop off in new vehicle unit sales for non-USMCA manufacturers. Consumers may be influenced to move to USMCA brands for which new vehicle prices will likely not increase as considerably. In the end, how manufacturers choose to address these changes will impact how individual dealers should plan for the future. Vehicle sales have already started to decline from the historical highs of 2015 and interest rates are increasing. If vehicle costs are expected to increase as well, it may be in dealers’ best interest to shift focus to fixed operations or used vehicles to ride out the potential cyclical storm. Dealers may also consider exiting altogether, given consideration to various factors such as succession planning, blue sky multiples, and current operating profits versus forecasted future results. Each dealer will need to evaluate their own unique situation as USMCA moves toward ratification. MBAF is a Top 40 accounting and advisory firm serving domestic and international clients. 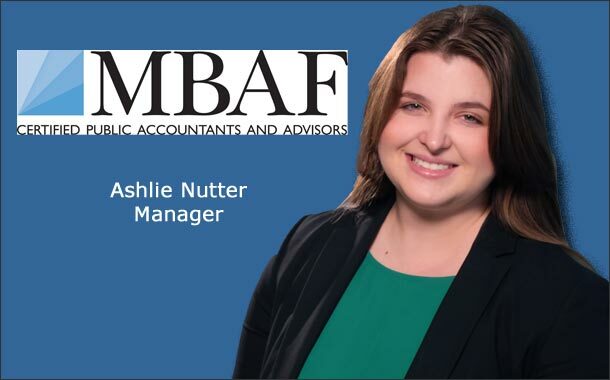 Ashlie Nutter is a manager in the MBAF Audit Department. She can be reached at (305) 373-5500 ext. 7307 or anutter@mbafcpa.com. Buy/Sell basics: What’s in an owners’ agreement?